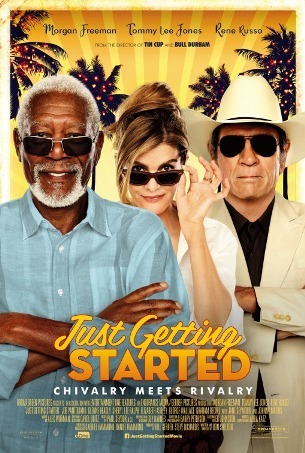 Broad Green Pictures releases Just Getting Started nationwide on December 8th, 2017. NYC MOVIE GURU: All of your films have one major common thread: they're grounded in humanism. How challenging and important was it for you to ground Just Getting Started in humanism? Ron Shelton: All that I'm trying to do is make movies, in whatever the genre, about human behavior which is far more interesting to me than things blowing up onscreen---even though I blew up a golf cart in the film. I have no interest in Death Stars or time travel. Human behavior is inspiring, compelling, dumbfounding, funny and many things, so that's all that interests me. Whether it's a romantic film like Bull Durham or something like Dark Blue or the whimsical Just Getting Started, it's still about people. That's sort of at the bottom of all of my writing and directing. NYC MOVIE GURU: Many characters in Just Getting Started are pleasant to be around. I feel like it's rare to find pleasant characters in movies these days. Do you agree or disagree? RS: I feel the same way. I don't really have that many villains in my movies. When I do, I make sure that they have the most features and are charismatic so that they're not one-note. I wish I had more scenes with people like Sheryl Lee Ralph and Glenne Headly in this movie. I had limited time and budget for this movie---just 28 days to shoot---so if I had 2 more weeks, I would've made a longer movie with more scenes with these people. NYC MOVIE GURU: Would it be fair to observe that Just Getting Started is a throwback to some of the screwball comedies of the Golden Age of American Cinema? Was your decision to name Tommy Lee Jones' character Leo McKay a reference to Leo McCarey who directed many screwball comedies during the Golden Age? RS: After I named his character Leo McKay, a few months later that connection to Leo McCarey dawned on me. I must've been aware of that connection on a subconscious level when I named him. Also, I wanted to make a movie that's 88 minutes long because I don't like movies that are too long. These kind of movies are better if you get up from your seat wanting more. All if your observations are 100% accurate. NYC MOVIE GURU: Do you think flashbacks would've worked in the film? What was the process like to decide how much violence to show and how to show it? RS: In this movie, I think flashbacks would've been inappropriate and when you have Morgan Freeman and Tommy Lee Jones telling you their backstory, you can't do much better than that. In a light, dry, witty piece like this, I think that a flashback might weigh it down a bit too much. In terms of the violence, it's all kind of throwaway. I shot the chase sequences in the best way that I could given my quick schedule, but they're shaggy dog chases. This isn't to be compared to a big budget film; we had a low budget, so I wanted to have a shaggy dog kinda feel that's well-executed. NYC MOVIE GURU: You also avoided cheap, low brow humor! RS: Thank you. If I see just one more flatulence joke in a movie again! That's all 15-year-old boy stuff. We're not 15-year-old boys. I have no Viagra jokes about people in their 70's! I tried to avoid all that. They're drinking, they're partying. They didn't go there to the resort to die; they went there to live and to party without regrets. Nobody has pictures or scrapbooks of their family. I figured that everyone went to there to reinvent themselves. There's dark tale underneath most comedies, but I've chosen to make a double light tale. NYC MOVIE GURU: Do you think that there's a shortage of movies for baby boomers in the marketplace? RS: I do. How many times do you open the paper and say, "What is there to see?" I think it's a little nuts. Even though I could've made an R-rated version of this movie---I wrote an R-rated version, but cut it down to PG-13---baby boomer audiences are not squeamish. You can go as far as you want with the right subject. Baby boomers shouldn't be patronized just because they're in their 70's. NYC MOVIE GURU: What does it mean to be a "grown up"? What's wrong with embracing one's inner child and being goofy? RS: I'm with you on that. One of the things that I did in Bull Durham. Crash Davis is in his late 30's and realizing that he's in love with something more than it loves him back: baseball. He's serious and has gravitas and is well-read, but he's still a kid somewhere on the inside. I'm like that. I've got a goofy side, but I'm serious about my work. NYC MOVIE GURU: You have a knack for finding actors with plenty of charisma. How would you define charisma? RS: I can't define it, but I know when I see it. If you ever want to visit one of movie sets, I'll show you the phenomenon. It's magical. If you could bottle that charisma, you'd be a billionaire. NYC MOVIE GURU: What do you think would make for a great double feature with Just Getting Started? RS: I don't know if you'd want to watch 2 movies about people in their 70's. That would be too much. A classic 1940's 85-minute comedy would make a great pair---a Howard Hawks movie. NYC MOVIE GURU: Do you think that something would get lost watching Just Getting Started on the small screen? RS: I hate to watch movies on the small screen, but I'm so old-fashioned. This one probably holds well on the small screen. I'm just a big screen kind of person. This would probably work either way, but I hope that your small screen is big!